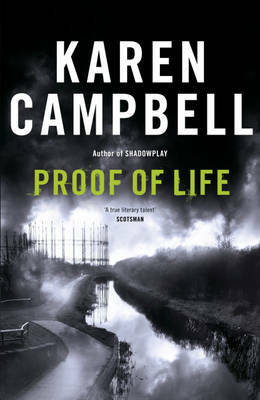 PROOF OF LIFE is one of those novels that has several apparently disparate strands that the reader gradually realises are connected, in this case converging into an explosive climax involving them all. This approach poses various challenges to the author, most of which Karen Campbell passes with flying colours. In particular, the tricky plotting is superb, as various characters see or just miss each other; as different people have different incomplete understandings of the same events; and information is partially or completely gathered or in some cases not gathered. Each character has to have credible motivation for their actions, and in the main I think here that they do. The slight failure is that the first half of this (long) novel is quite slow and rather irritating, for example Anna Cameron's appearances are mainly limited to her physical condition and her ruminations on it, as well as her interactions with her (standard-issue grumpy) newly acquired teenage stepdaughter; elsewhere some schoolboys get up to various antics but one cannot see how they fit into anything else. A pivotal event occurs roughly 50 pages in, when a young woman comes to the police station where Anna works and asks to see her. Anna is shocked when she recognises this person. But we have to wait nearly 150 pages to find out why (or anything about this event). There is a murder near the start of the book: the body of a woman is found in a Glasgow canal and turns out to have been killed in a nasty fashion. The reader is misdirected a few times as to the identity of the body, but the woman seems to have been connected to a local riding school. The school is under threat of closure because of building development, and for some time one character is convinced that this fact is the motive for the murder - and she takes this supposition to some rather amusing if poignant extremes. There are also various contemporary social themes underlying the plot: the city's attempt to introduce a "smart" card that will track people's dealings and the increasingly uneasy and hostile response of its citizens to this proposal; and the pitch by the city for the Commonwealth Games and how the police plan to deal with that. The plot of this novel is so twisty and turny that I don't want to provide more synopsis here in case it spoils the various moments of discovery that pepper the novel's second half. The whole story turns out to hinge on a case described in the first novel of this loose series, THE TWILIGHT TIME, but while this is a strength in the sense that there is a solid set-up and back story unusual in crime fiction, it is also a weakness in that the reader has to remember minor characters and plot details of the first novel which frankly I had forgotten. The author does provide a few aide-memoires later on which are useful in understanding the dynamics between Anna and an ambitious younger sergeant Alex (the man investigating the murder), and why Anna sometimes impedes and sometimes helps the case. If you bear with this novel, you'll find it very satisfying. I am not sure what to write about the ending (in which two other characters from previous books make an appearance), partly because I don't want to give away any spoilers - but it is shocking. The author builds up the tension very well, as a malign sense of threat comes increasingly to the fore, and ties all the previous threads into a believable climax that illustrates neatly the problems of a stretched police force having to deal simultaneously with a major incident as well as less dramatic but just as dangerous ones. I have to say I found Anna's actions in the last sections not credible - up until a certain point I could understand why she acts in devious ways, but two events occur near the end that I just could not believe (one in particular seems ludicrous to anyone who has been in the same situation) - Anna chooses alternatives that seem obviously much worse than the issue she is trying to avoid. She's a desperate woman in some ways, but also a bit intangible, and it is therefore hard to completely buy into why she made a couple of choices if her emotions are truly as portrayed. Nevertheless, the ending has a big kick to it, and I am left admiring the author for, yet again, producing a top-quality, very well-plotted and confident novel, pushing the envelope of the "series" concept in a book with plenty of well-observed details of police procedures, bus driving, working in a council press office, and so on. Each book the author has written is very different from the previous one, so I am intrigued about where Karen Campbell will be going next. Read another review of PROOF OF LIFE.